Future Pinball is a pinball construction kit that enables users to play, adapt and create superb pinball tables based on real or imagined machines. The great thing is that many games that may have been inaccessible in the arcades can be made highly accessible at home. There are a growing number of adapted and unique pinball tables kindly hosted by Retro Remakes that show some of the ways pinball can be made accessible. One-switch play is possible, games can be slowed down, the tilt feature can be disabled and so on. The following information should be enough to get you playing games. Further on you will find tips on how to adapt other pinball tables to make them easier to play. Download then install Bit Torrent. 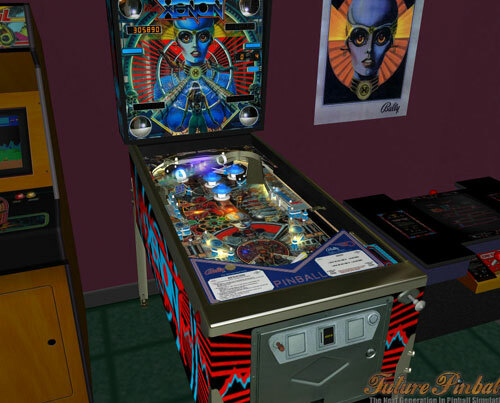 Once you have fully installed Bit Torrent, go to the "Download" page of FuturePinball.com and click on the link that looks something like this "Future Pinball 1.9.20081225.torrent". Double-click on the Future Pinball icon to start the installation. Next you will need to download some pinball tables to play. You can find links to many adapted and unadapted pinball tables at the one switch games showcase. I would recommend starting by downloading the adapted OXO table. Bear in mind that 'zipped' tables will need to be 'unzipped' before they will work. If games run slowly, you can try reducing the graphics quality via the Video / Rendering Options reached by the "Preferences" menu. I then recommend you start Future Pinball application (if you can't find it, look in the "Program Files" folder of your C: directory) and press F1 to open up the help guide. Pay special attention to the "Playing a Table" guide. The first thing that you should do if you wish to play a one-switch game of pinball is to redefine some of the controls. Do this by going to the Preferences menu then selecting "Game Keys and Controls". Here change all flippers, the plunger and the start button to the LEFT-SHIFT key. Next assign your accessibility switch to act as that key. LEFT-SHIFT = Flippers, Plunger and Start button. CURSORS LEFT, RIGHT, UP = Nudge table. "5", "1", "ENTER" = May be needed to insert a coin or enter initials on some tables. PAUSE = Pause game and view High Scores. TAB (Held Down) = Look at Backbox. F11 Mouse controlled Camera (use alongside ASDW keys). There are a number of ways to make any pinball table easier to play, although some involve more effort than others. Slowing Play Down: In the table editor, click on an empty area of the playfield. Find the "Physics" pane on the right hand side then slightly reduce the "Table Slope (1∘; to 10∘)". This will take some trial and error so hit F5 to play test your changes. Blocking off Outlanes: You can place pegs to block off any outlanes which normally allow for balls to be lost down. At the bottom of the editor screen click on "objects" then "peg". Your pointer should turn into a cross-hair. Click on the table where you want to place your peg. You should then be able to adjust the style and positioning of the peg to suit. See the Help Guide (press "F1") for more essential help. Moving Flippers Closer Together: Click on one of your flippers in the edit screen so that it's properties appear in the right side pane. Next right-click on it. If it is ticked as being "Locked" you will need to unlock it. You can drag the flipper when it turns green with the mouse, or use the cursor keys and SHIFT to reposition. You may need to stretch out other table objects which again, you may need to unlock. Adjusting the Playfield: Doing this can help aid comprehension and tracking of the ball for those finding the existing playfield too busy. The simplest way is to click on the playfield to bring up the related properties pane. From there select "None" to be the Playfield Image and finally choose the playfield colour. More advanced users may choose to export the playfield image via the "Table" "Texture Manager" and adjust it within a graphics package such as Irfanview or Photoshop. It will then need to be imported back into Future Pinball. All Future Pinball tables rely upon a set of rules known as the "Script" in order to function. Freeplay on (no need to insert coins); Tilt disabled; Plunger sound disabled (gets annoying otherwise for one-switch play); One-switch rotation of bonus lights possible. Click on the "Script" icon to take a look at the logic code of the current pinball table. Take a little look through to see if any of it makes any sense. Save a back-up copy of the script in case you mess things up. Muting the Plunger: Search the code for "PlaySound". You are looking for something that reads like Plunger or PlungerRelease. Comment this line out by preceeding that line with an apostrophe. Enabling Rotate Bonus Lights: When pressing the left-flipper and right-flipper simultanously in one-switch play you may find that the bonus lights no longer rotate. You can cure this issue by disabling one half of the subroutine that is expecting the left flipper to rotate left and the right flipper to rotate right. In Ignition the subroutine is named "Sub RotateWarpLights". Removing one flipper from this routine cures things. Disabling "INSERT COIN" Text whilst playing: This may appear whilst playing completely obscuring the score. You will need to locate the "- INSERT COIN -" text then comment that line out. Setting FreePlay: This normally comes early on in the script and you will need to set it to TRUE. This removes the need for the additional button. It has issues with multi-player games though so you may find it necessary to find the Maximum Players variable e.g. "constMaxPlayers" and set it from 4 to 1. Switching off Tilt: A bit tricky but normally you'll need to set the variable 'nvTiltWarnings = 999999 and the TiltWarningTimer needs to be set very low. Disabling the High Score Routine: I've not managed to do this yet, but it is desirable to avoid the need for extra buttons to enter initials. From the on-screen menu you can navigate with a mouse or the cursor keys. Press RETURN or double-click when you have selected the game you wish to play. Don't forget to take a good look at the instructions first at AtariAge to give you a better idea of what does what. Have fun!